BJJ is a playwright with a conundrum. He is tired of pandering to white liberal producers and audiences, so he thinks of the most extreme thing he can do to offend them: a minstrel show. With the help of 19th-century playwright Dion Boucicault, Br’er Rabbit and some inspiration from movies such as Gone With the Wind, Song of the South and Birth of a Nation, he creates the most hilarious and offensive show of his career. This is the basic premise of Branden Jacobs-Jenkins 2014 play An Octoroon, onstage at Actor’s Express through February 24. Atlanta newcomer Donya K. Washington helms this weighty production, which is an amalgamation of a farce, a sideshow and a plantation drama. The show opens with Br’er Rabbit (Curtis Lipsey) playing jokes on the audience, and throughout he is both jester and puppet master. As BJJ (Neal Ghant) reflects on the Old South, he becomes some of the characters, painting himself in white face and portraying a plantation owner George and slave catcher M’Closky. What unfolds is a story about Dora (Brandy Sexton), the heiress of a struggling Louisiana plantation called Taraboone, and her cousin Zoe (Kylie Brown), who both have their eyes on George, the only man with enough money to save them from squalor. 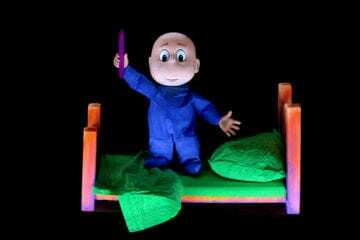 However, M’Closky finds a pivotal piece of information about Zoe that could ruin everything. While the white folks sort out their non-issues, an Uncle Tom-like character Pete (played by Ryan Vo in black face) and his trusty Indian companion Wahnotee (played by Kyle Brumley in red face) keep up the tomfoolery around the plantation. Their hijinks are a perfect distraction for the female slaves, Dido (Isake Akanke), Minnie (Candy McLellan) and Grace (Parris Sarter), to plan an escape. Still with me? Jacobs-Jenkins’ inspiration for the show comes from 19th-century writer Dion Boucicault’s play The Octoroon, which was a hit in its day. “Octoroon” is a derogatory term used to describe someone who was one-eighth black during slavery, and according to the sentiment of the day, one drop of blackness was enough to taint any whiteness, regardless of appearance. Disguised under the cloak of a minstrel show, Jacobs-Jenkins rips at the foundation of American entertainment and the ways that white people creating and spreading negative stereotypes of indigenous people and African Americans have created destruction in those communities. The show is cringe-worthy and funny in the way that it amplifies the absurdity of slavery as an institution and any sort of reverie for the Old South. The production features a strong ensemble cast playing multiple characters in a vaudevillian fashion. Beloved Atlanta actor Neal Ghant takes on triple duty as the playwright, Master George and M’Closky and is in rare form in this comedic role. This departure suits Ghant, underscored by a wry humor, punctuated physicality and devilish grin. He is a madman changing costumes and demeanor from character to character in a matter of seconds. 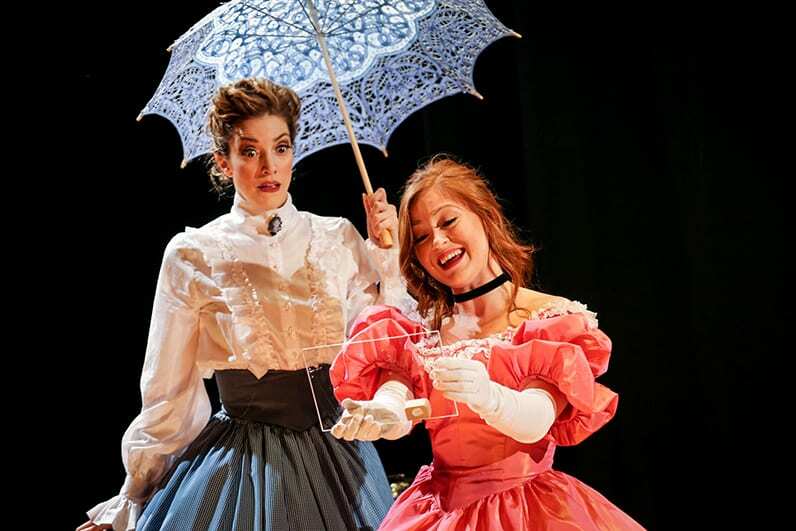 Sexton and Brown as distressed Southern belles have impeccable comedic timing. And McLellan and Akanke are worthy of their own show, transitioning from subservient mammy to delivering subversive, fierce one-liners from moment-to-moment with ease. Dido and Minnie plot an escape as Taraboone seems to be beyond saving. Jacobs-Jenkins’ position is clear: slavery was cruel, and there is no need for sympathetic white characters — the only thing that will do is a send-up. 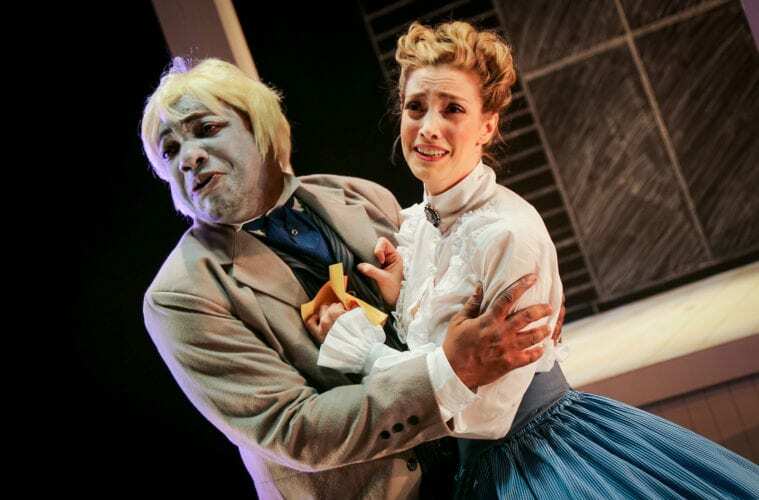 The play is effective in that it doesn’t bludgeon the audience by making them feel bad but rather uses humor, which is also the production’s weakness. I’m not sure that the subversiveness offers anything more than laughs. Will America knock Gone With the Wind and Uncle Tom’s Cabin off of their pedestals because their stereotypical portrayals of black people are problematic? The answer is highly unlikely. It’s easy to look at the over-pronounced melodrama of yesteryear and denounce it, but the raucousness of it all makes it seem too distant to be convicting. We don’t put people in cages and hold them against their will anymore. That’s not us. In the show, the fictional playwright BJJ describes a moment where he was asked who is a playwright whose career he admires. He responds Boucicault because of the fame and success he achieved in the late 1800s — The Octoroon ran on and off Broadway for years. 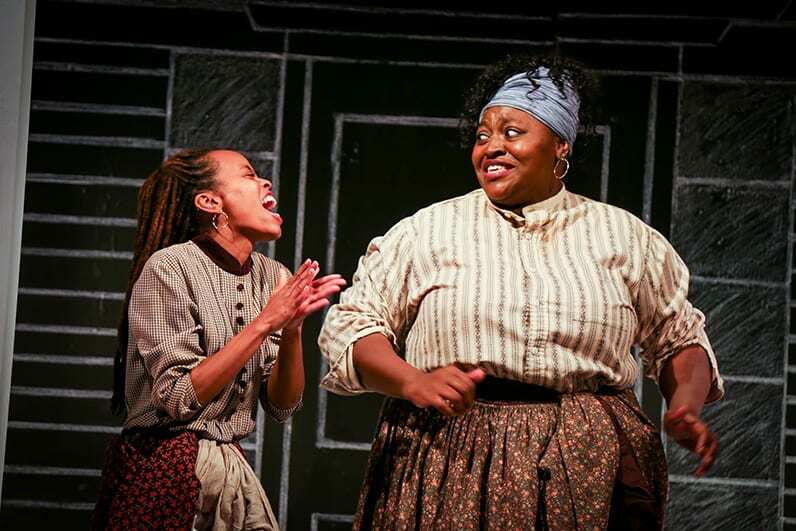 Jacobs-Jenkins’ An Octoroon was first produced Off-Broadway at Soho Rep in 2014, won an Obie Award for best new American play and has been produced at theaters across the country. What worked for Boucicault worked for Jacobs-Jenkins, which is either a reflection of how much theater audiences have changed or how much they haven’t. Either way, Actor’s Express has done a marvelous job of giving the audience a lot to chew on between laughs, and that’s well-worth the experience.